Ah, Santorini. The destination that I have been pinning on my Pinterest boards for years. The magical place that I’ve been taking iPhone screen shots of since the day Instagram became a thing. The top place on my bucket list. The place that poets have written about and artists attempt to capture its beauty. The place where everything is photogenic. Oh yes, it’s been years since I’ve dreamed of coming to Santorini and I’ve made it, I was finally here and this was nothing short of my dream destination. The blue and white painted houses hang over the cliffs and overlook the deep blue Aegean sea. It must be one of the most beautiful views in the world! From the red, white, and black beaches, to the atmospheric villages, makes this the most mythical and impressive destination that I am thrilled to have experienced. We booked a flight right out of Athens, Greece and flew Aegean airlines. The flight was about 25 minutes. There are taxis outside awaiting arrivals that will bring you to your hotel. We rented quads which your hotel can arrange for you for 20 Euros a day. You don’t really want a car since the roads are dangerously curvy and narrow. The island is also very small, making it difficult to find parking spaces big enough for cars. We enjoyed riding the quads and it made our experience fun and easy to zip around the whole island. We visited almost every village and it is impossible to get lost. Having the quads was a fun way to explore the island. Rent a boat! A lot of blogs and reviews recommend scheduling a day cruise. I like to avoid tourists as much as I can and soak up as much as the culture and beauty Santorini has to offer. Instead of scheduling a cruise, we walked up to a fisherman on the island and asked him what he would charge to privately take us around on his fishing boat. He charged 60 Euros per person which I thought was a pretty good deal considering our other option was to pay 100 Euro to join the bigger tour boat that was overcrowded with tourists and their cameras. Ugh, no thanks. Our fisherman was so kind and the best tour guide! He drove us right to the Volcano of Santorini. This was a beautiful experience. This is the most renowned active volcano in Greece. You could see all the tiny bubbles coming from to the surface. And the best part? We were the only ones there. It was amazing to swim right over an active volcano and feel the heat of the volcano in the ocean. I’ll be honest though, every time I felt the water get a little too hot, or heard a distant boat drive by, I feared the volcano was erupting and Milti would laugh at me. 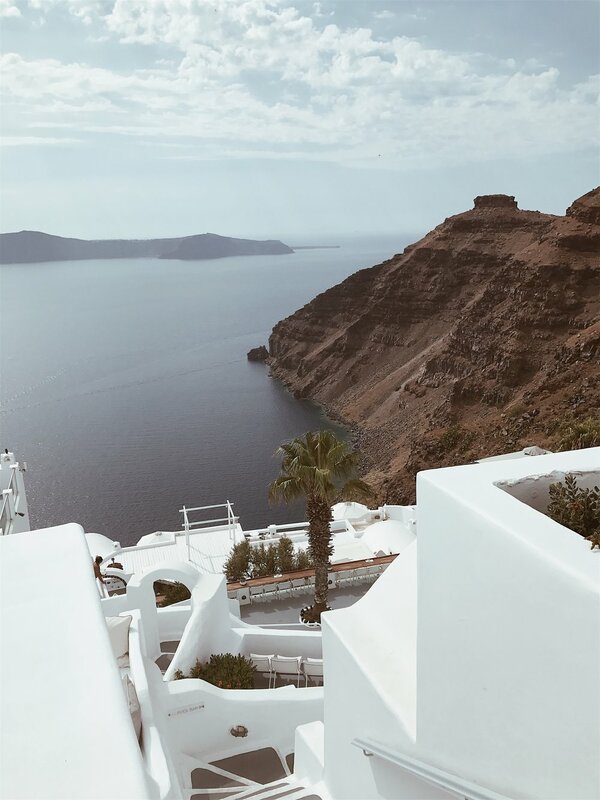 It is said that Plato was thinking of Santorini then called Thira when he wrote about the mysterious lost civilization which is now under the sea. This has been directly linked with the mystery of Atlantis and this volcano from many scientists over the years. We drove the boat around some more and stopped for another swim. I look down 90 feet below and the water remains crystal clear. The fish were big and colorful and it is said that there are no sharks. The beauty of the Mediterranean water will seduce you and grasp your attention without even trying! There are many beaches in Santorini but keep in mind these are not like your Caribbean beaches. These are more rocky and earthy looking. I recommend sturdy sandals or water shoes. 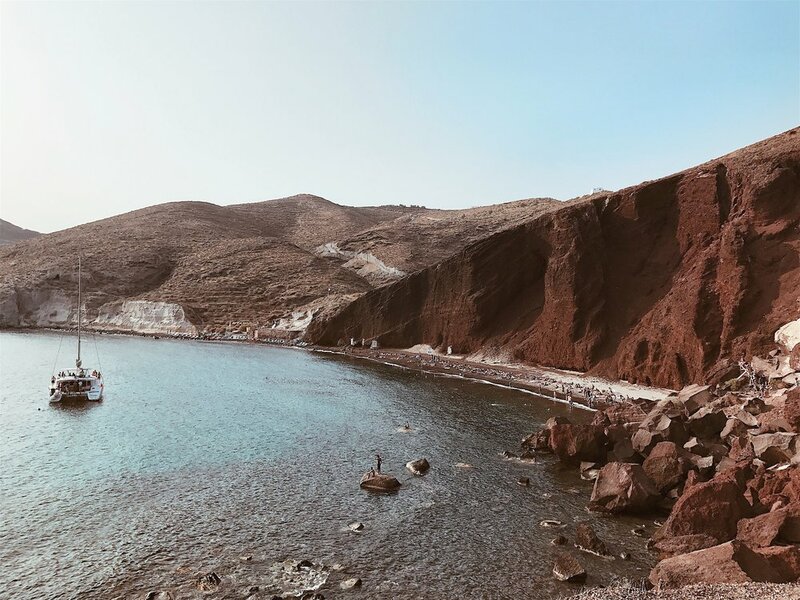 Out of all the beaches we went to in Santorini, The Red Beach was the best. It is one of the most unique and beautiful beaches with impressive landscapes of high red cliffs that make you feel you are on a different planet. Here I had my own fun by collecting some cool and different looking rocks. Shop the local boutiques Oia (pronounced Eee-yah). 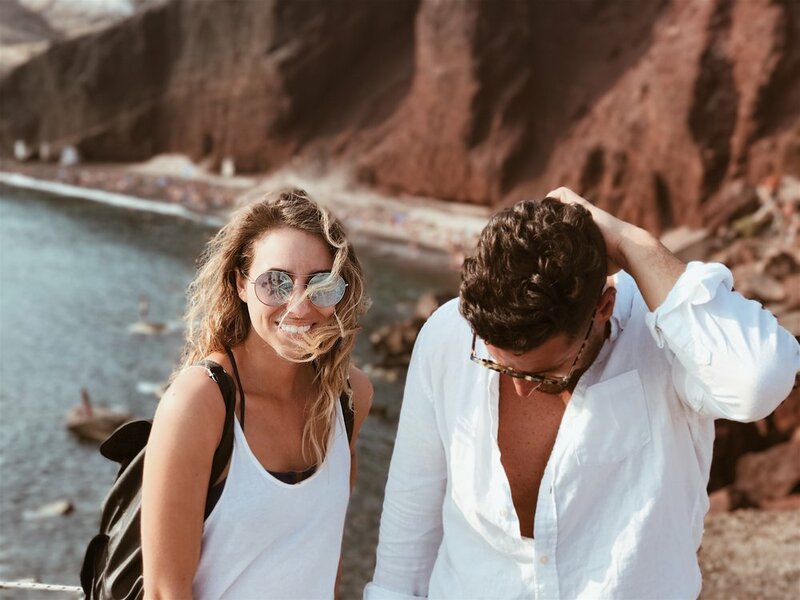 Oia is on the point of Santorini and the farthest away from everything. Most of the photos you see on Instagram are from Oia. 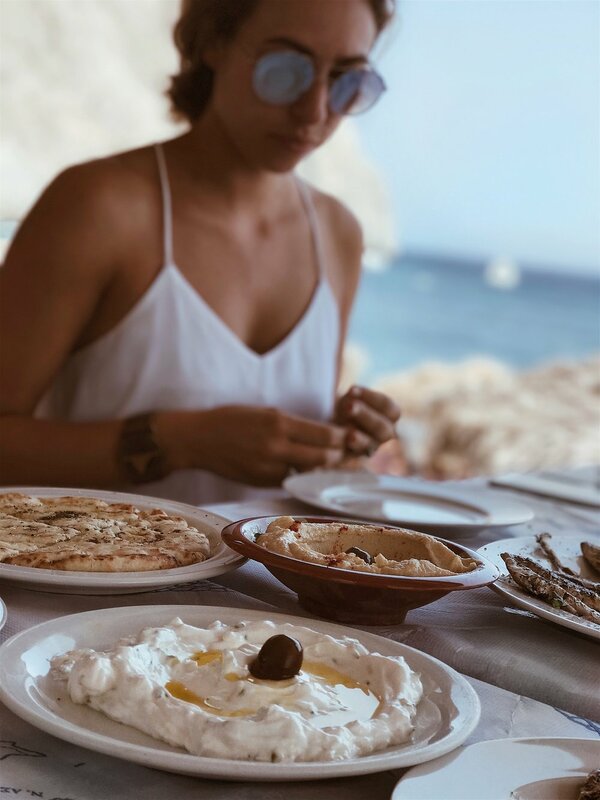 It is a beautiful village that you must eat, drink, and shop in but it can be one of the busier and overcrowded parts of the island due to popularity. I was pleased to shop some cute finds here! Watch the sunset. 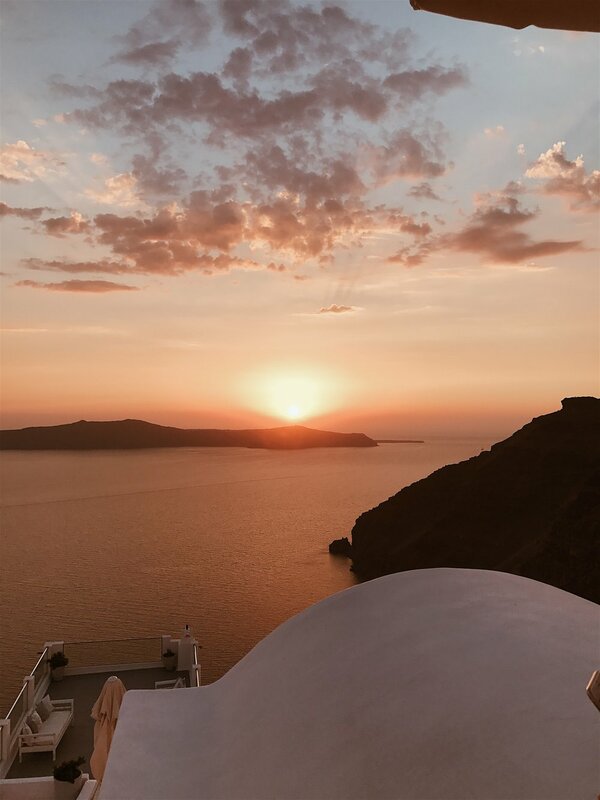 I have never witnessed a more beautiful sunset than Santorini’s. Read a book on your terrace and soak up the views as you read. I pinched myself a million times! I highly suggest ordering Feta, Saganaki cheese, tzatziki, a Frappe, and a Greek salad anywhere you go. 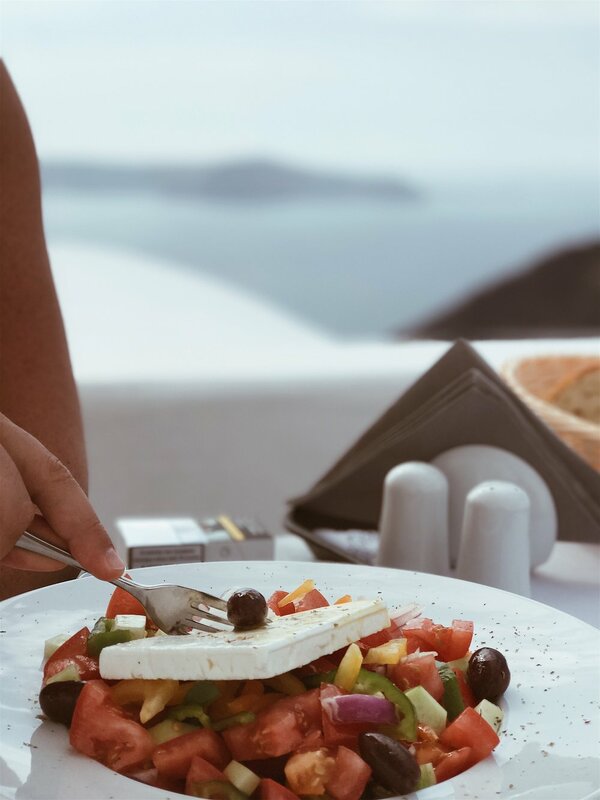 Taverna Giorgaros in Akitori is the perfect spot for a traditional Greek dinner that is “off the map” so you won’t find many tourists here, only the locals. This is a family owned restaurant and our waitress told us her Father catches the fish during the day, and her Mother cooks for the restaurant at night. 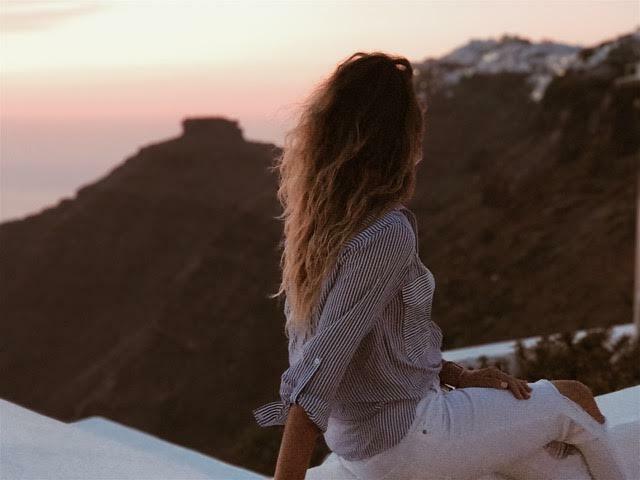 Giogaros has the most beautiful views of the sunset which overlooks the cliffs and the sea. The food is excellent with high quality, large portions and reasonably priced. Kastro in Oia was a fabulous dining experience. The food quality was great and the views are spectacular! I ate homemade pasta and mint meatballs which were fresh and flavorful. I suggest making a reservation in advance since this is a popular dining area. 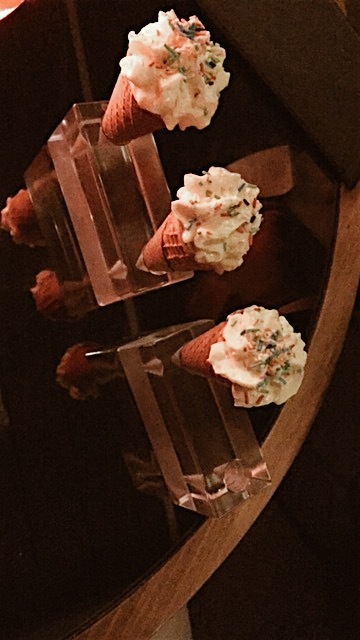 Don’t skip out on dessert here! La Maison in Imerovigli is sensational! Note that this is not your traditional Greek cuisine, but you must go here for a trendy, fine dining experience. We ordered off the a la carte menu and every dish was divine. The menu is very creative and the presentation of each dish is gorgeous. All the food had great flavour combinations, but be sure to try the truffle risotto! The view is another spectacular one. And once the sun went down and the night air became chilly, the waiters brought me a cozy blanket to stay snug and warm. -You can’t throw toilet paper in the toilets anywhere in Greece. -Exchange your dollars for euros before you arrive, most places take credit cards but prefer cash. -You don’t need to wear a full face of makeup. It is hot and the makeup will slide off your face, let your skin breathe here. -Make sure to get a new memory card for your camera before arriving. -Go on the stair master at the gym before you come here! Haha! Seriously you will be climbing a lot of stairs. 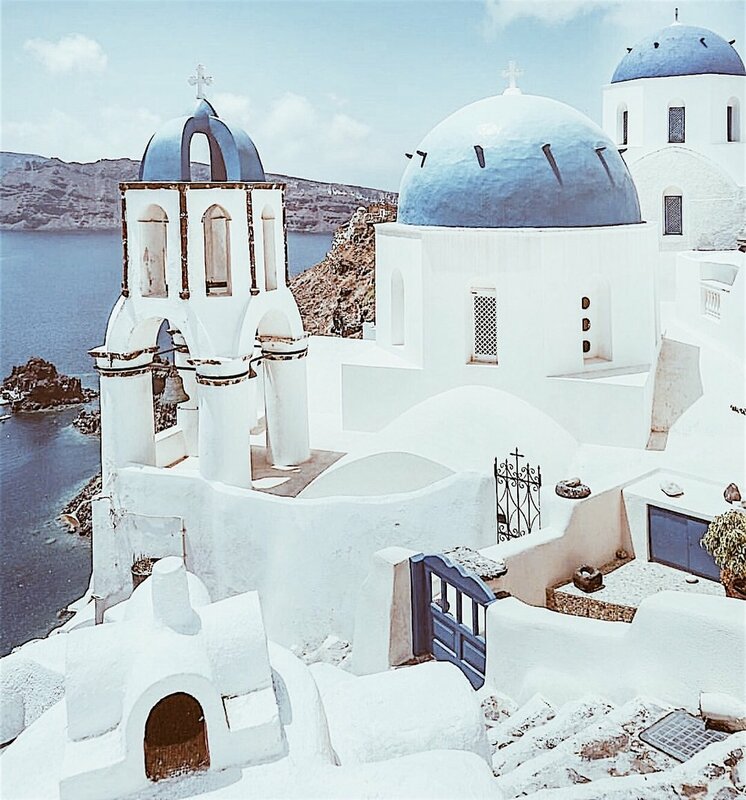 -Oia is beautiful but the most crowded and expensive area in Santorini -4 days is long enough in Santorini to explore everything -Don’t forget to pack aspirin, outlet adapters, water shoes (it can get rocky in the water), sunscreen. -Don’t pack heels. Due to the rocky roads and cobblestone paths, you won’t be wearing heels here only sneakers and sturdy/comfortable sandals. @AlexGill & @JenniferYepez famous hair stylist of Jessica Alba, Hailey Baldwin, and Nicki Minaj to name a few! The magic of Santorini will exceed your expectations. The mysteries of the sleeping volcano, the unique and stunning beaches, and magical sunsets are just some of the rare features that make up the beauty of this island. To read about our next destination to Evia click here.